The Verju Laser System is a new revolutionary technology designed for the most advanced non-invasive body contouring treatment for laser sculpting. The result of nearly 20 years of research on the fat cells by Erchonia, the Verju became the first and only FDA market cleared green body sculpting laser for circumference reduction of the waist, hips & thighs. Verju offers the most superior treatment coverage with (6) patented green (532nm) line generated laser diodes. The green output ensures 25% more energy than that of any predecessor laser sculpting device. Proven to work on patients with BMI ranges exceeding that of any other laser sculpting device, the patient simply lies down in a relaxing position for 20 minutes on their back and then 20 minutes on their front. The Verju does all the work to target the enlarged adipocytes and decrease volume to create the slimming effect that is sought after by both women and men alike. The clinical study results were so enlightening, they were published in the American Academy of Cosmetic Surgery. For complete information and news on the Verju Laser System and its body sculpting abilities, please visit www.verju.com. 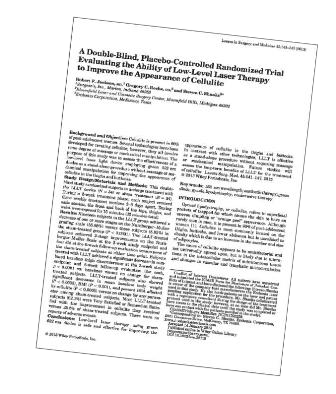 A placebo-controlled, randomized, double-blind, multi-centered clinical study (n=34). The study enrolled healthy subjects who were 18-55 years of age and expressed a desire to improve the appearance of cellulite. Subjects had moderate bilateral thigh and buttock cellulite graded as Stage II or III on the Nurnberger-Mueller scale. This double-blind study randomized patients to undergo treatment with the 3LT® device or a sham treatment. Nineteen subjects in the 3LT® group achieved a decrease of one or more stages on the Nurnberger-Muller grading scale versus three subjects in the sham treated group who received no decrease on scale. Subjects treated with the 3LT® device also received a significant decrease in combined baseline thigh circumference at the (2) week end point and (6) week follow up versus no change for sham treated subjects. None of the participating subjects reported a deviation from baseline diet, exercise or medication use during the study that would impact study measurements.